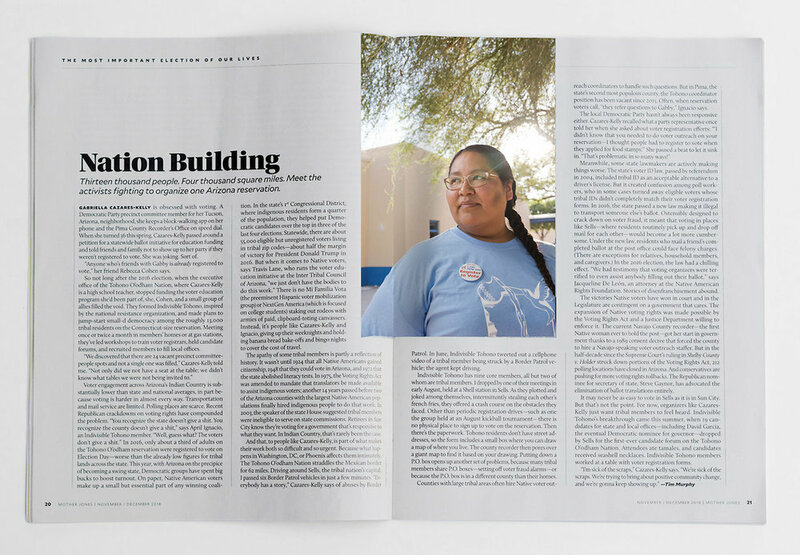 I recently photographed a story for Mother Jones on Gabriella Cazares-Kelly, a Tucson-based activist. Cazares-Kelly is a high school teacher and also works to register voters on the Tohono O’odham Nation in southern Arizona. The Tohono O’odham Nation is a federally recognized tribe that is the second largest reservation in Arizona and approximately 4,000 Square Miles in size stretching across the US / Mexico border. After the 2016 election the executive office of the Tohono O’odham Nation stopped funding for its’ voter education program. Cazares-Kelly along with a few other activists formed Indivisible Tohono, inspired by the national resistance organization. They meet once or twice a month and lead workshops to train voter registrars and recruit members for local offices. The size of the Tohono O’odham Nation and the fact that it has only one Post Office doesn’t make it easy to reach potential voters. In 2016 only 30% of adults on the reservation were registered to vote. Recent crackdowns on voting rights have only made it harder to register eligible citizens. Cazares-Kelly said “We discovered that there are 24 vacant precinct committee-­people spots and not a single one was filled,” Cazares-Kelly told me. “Not only did we not have a seat at the table; we didn’t know what tables we were not being invited to.” Read the entire story on the Mother Jones site. As a Phoenix, Arizona editorial photographer, I often photograph assignment work throughout the state of Arizona in locations such as Phoenix, Tucson and Flagstaff. I regularly work with national editorial magazine clients because I am based in the Southwestern United States with close proximity to great locations throughout Arizona, New Mexico, Utah, California and Nevada. My extensive work as an environmental portrait photographer puts my subjects at ease in front of the camera and allows for a genuine more natural result.